Previously on this Review, the attacks on this blogger have been documented here, here, here, here and here. Pathetically, this childish, deceitful and malicious flame war has not stopped. It's not likely that anyone will ever care about studying the manners and behaviors of Glenn Beck's "army of psychotics," but for what it's worth to anyone who might want to understand the way Beck's followers "think," and "understand" his critics, these are three examples of flame wars where a comment was made on a story about Mr. Beck, and a clique of his followers, using the "history" feature of Disqus to track all comments made by this blogger, attack me for pointing out what is usually intuitively or blatantly obvious. It doesn't matter, their objective is to drive this critic away and, barring that, to undermine my credibility with smears, character assassination and, of course, insults. 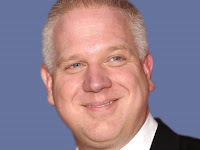 1) Alternet, a progressive news site, ran this story: "Glenn Beck declares war on 'Glee.' " In this particular battle, I purposely set this clique of fanatics up to make an exhibit of just how sleazy, malicious and deceitful they are. Hmmmm, wonder where they get the inspiration for that from? Their attacks and my replies take up the better part of 40 pp. of comments! This is one particular gem from a woman who is suspected to be the same "momwith5kids" that terrorized my wife. "Momma Grizzley" feels free to wage this type of sleazy defamation of character because it's very expensive to track her IP, find her location, serve her with papers, hire a lawyer and then attend a trial most likely out of state. And so it goes on page after page of sleazy, hypocritical character assassination because I point out that their hero is a liar and a hypocrite. "Insanity." It's easier for Beck's ardent followers to believe I'm "insane" than it is to wrap their heads around the fact that Glenn Beck lied about having written that slogan. Cognitive dissonance must be avoided! 3) The next example comes from a piece on FreakOutNation, "Glenn Beck on leaving Fox News: "God said, if you do not leave now, you will lose your sole." Yes, Beck said that. At any rate, someone, who has been documented here previously, Todd, "debunk the truth," Scheller, demonstrates how he twists the understanding of words to not mean what they actually mean. Todd doesn't know the difference between an intelligent question and a dishonest question. No wonder he can't grasp that Beck asks dishonest questions. Oh how much fun it is to be targeted by a clique of fascistic followers of a reactionary propagandist! 4) The last example here (there are many, many examples of this childish flame war that Disqus allows) comes from The National Journal. On a story they posted about Governor Romney promising to bring the bust of Churchill back to the White House, the let loose another flurry of personal attacks on me. It's so ironic to read comments from "Captain America," a telling, cartoonish name if there ever was one, calling me "insane." His line of attacks have been continuing for the last few months or so, but his information about comments made using Disqus goes back to well over a year. He just made up a new ID for the sole purpose of driving me off the Internet. It's hard to believe that he's not violating Disqus posting policies. This is fairly mild for him, but his motivation and goal is clear: "just leave." Stop posting comments online and he and the rest of these immature clowns will leave me alone. This is what fascism without power looks like. This and violence directed at people these fascists don't like the color of. Update, 5/11/2013: These silly attacks have largely disappeared since the blogger began employing the comment and delete tactic, demonstrated initially by Benny, the racist, Hill. This ends up turning the comment into one posted by "Guest," and makes it far more difficult to be located by this pack of attack dogs. If they do find one, then this silly, childish flame war is resumed as it was this week over at the Media Matters website. Not that another example of this fascistic manner needs to be put on exhibition, none the less, this is what fascism looks like. 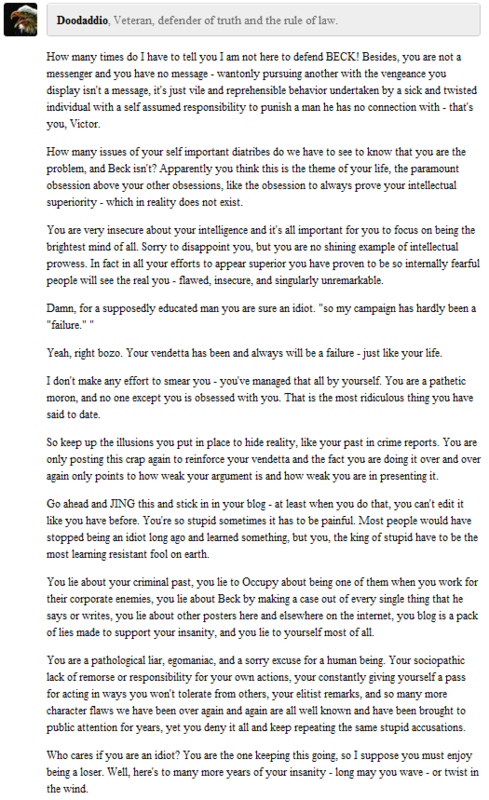 Update, 7/06/2013: For the last few months, one particular follower of Beck has been tracking my Disqus comments and making an ironic, deceitful comment, calling this critic of Beck "the Original Peckerhead Beckerhead." 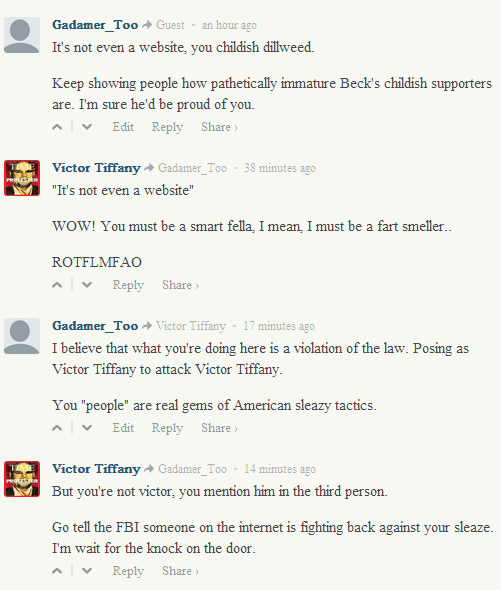 Last Sunday, he decided to post comments by impersonating me, using my own easily copied Gravatar. This documentation is primarily for legal purposes since it is against the law to do this in NY. In this exchange, this blogger is "Gadamer_Too" and anonymous Guest149 is posting as "Victor Tiffany" and using my picture, created in photoshopp by my wife. Is there any tactic that these fascists will not use? 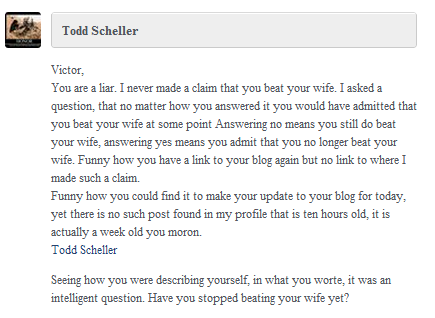 Update, 12/14/2013: Anytime these days that I do not delete a Disqus comment (turn it to Guest), Todd Scheller, lead fascist at this point, finds it to launch another round of personal attacks, soon joined by his fellow Beckerheads who have the common sense, at least, to not use their actual names. The day that Nelson Mandela died, I wrote comments on the Politico news post critical of the reactionary racists posting malicious comments about that great man. The next day, Todd initiated another round of insults and smears. By weeks end, he was joined by at least four others. This time, I notified the WV authorities where Todd lives. For more, see "Nelson Mandela, anti-apartheid crusader, dies at 95." There is indeed, no deception, no twisting of reality to make it appear as if I'm the initiator of these flame battles of smear, libel, insult (of my intelligence of course) and overall character assassination that these fascists will not employ. 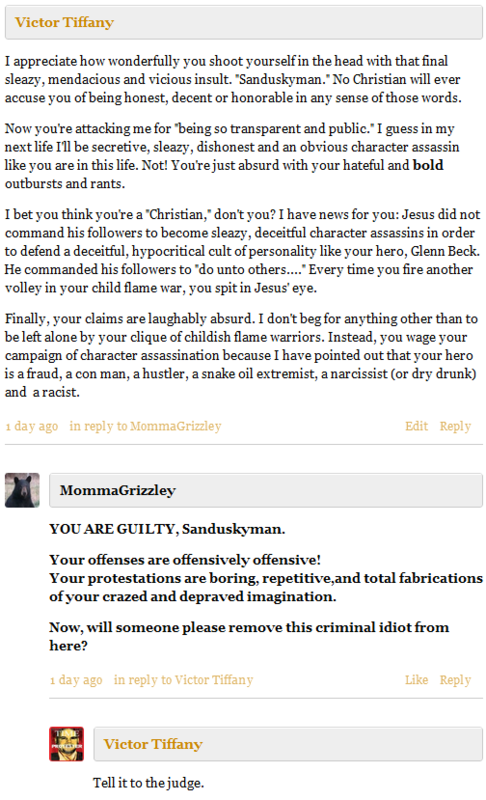 Essentially, I'm compelled to "Guest" (delete) every comment I post using Disqus to hide from these amoral followers of Glenn Beck who are deluded enough to believe themselves as "Christian." For a summary about Glenn Beck, see "Becoming Paul Revere"
"Take care that the laws be faithfully executed." Great Day Alert: Glenn Beck is OUT at Fox News!!!!! !